The Fourth Industrial Revolution is coming in the next decade, and no, contrary to the breathless rhetoric of the likes of the World Economic Forum, it is not centred on robotics and artificial intelligence as significant as these advances are. Rather, as with all previous such revolutions, it will be driven by the release of a new form of energy into humanity’s ecosystem. The global economy has always evolved thermodynamically: bursts of energy followed by dissipation followed by a new burst then dissipation and so on. The first two industrial revolutions used steam and electrical energy to leverage humanity’s brawn. The third used computer energy to leverage humanity’s brain. The fourth will release renewable energy, mostly solar and wind, into our ecosystem thereby making cheap and indeed almost free energy near universally available to all. And before long, renewable energy will allow cheap water from desalination to be widely available. 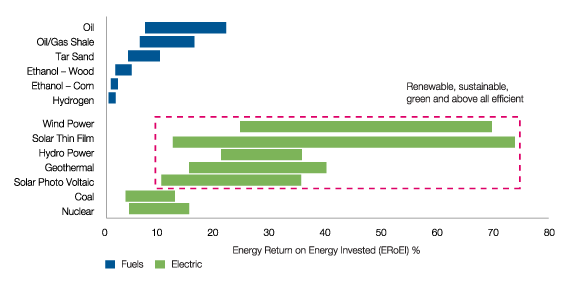 Renewable energy in terms of energy return for energy invested is already head and shoulders above fossil fuels. Source: 8020vision.com, as at 01.12.15. Please note that this chart has been redrawn by Investec Asset Management. 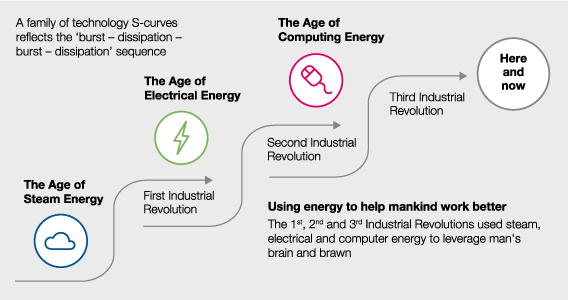 The other two hallmarks of an industrial revolution – apart from the release of a new form of energy – are that the costs of providing and using that energy fall geometrically rather than arithmetically thus facilitating a matching rate of adoption that rises geometrically rather than arithmetically: this is the essence of what makes that new energy source so ‘revolutionary’. We are on the cusp of the renewable revolution. Indeed we are entering a period of ‘free’ energy, free in the sense that once the capital expenditure itself is complete, the fuel feedstock is free – it doesn’t have to be mined or pumped and burnt. Source: Earth Policy Institute/Bloomberg. Please note that this chart has been redrawn by Investec Asset Management. And whereas the United Kingdom led the First Industrial Revolution, and the United States led the second and third, China will lead the fourth. This is because its productive might is driving down costs and so prices of solar and wind energy, and its demand is underwriting the growth in the rate of adoption. 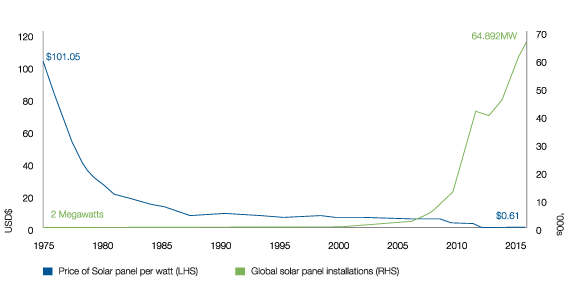 Source: NREL, May 2018. Please note that this chart has been redrawn by Investec Asset Management. China’s expressed determination to clean up its environment is backed up by physical reality – these aren’t empty promises or platitudes. In August 2017 the government publically reprimanded and punished nearly 100 senior officials in Gansu province for severe ecological damage, in a sign that Presiden Xi is willing to take on China’s ponderous yet powerful bureaucracy. But the real action is on China’s drive for renewable energy self-sufficiency. Indeed, in reality, low-cost, energy-short China is driving the industrial economics of the renewable energy revolution in both wind and solar energy. We believe that the value creation derived from the Fourth Industrial Revolution will outstrip value destruction. But coal and oil will suffer as did horsepower with the arrival of the automobile. Tropical and subtropical emerging markets that are energy and water-short could benefit even more than developed nations, which could see a jump-start in their productivity growth. General risks: The value of investments, and any income generated from them, can fall as well as rise. Past performance is not a reliable indicator of future results. Investment objectives and performance targets may not necessarily be achieved, losses may be made. This communication is for institutional investors and financial advisors only. It is not to be distributed to the public or within a country where such distribution would be contrary to applicable law or regulations. If you are a retail investor and receive it as part of a general circulation, please contact us at www.investecassetmanagement.com/contactus. The information may discuss general market activity or industry trends and is not intended to be relied upon as a forecast, research or investment advice. The economic and market views presented herein reflect Investec Asset Management’s (‘Investec’) judgment as at the date shown and are subject to change without notice. There is no guarantee that views and opinions expressed will be correct, and Investec’s intentions to buy or sell particular securities in the future may change. The investment views, analysis and market opinions expressed may not reflect those of Investec as a whole, and different views may be expressed based on different investment objectives. Investec has prepared this communication based on internally developed data, public and third party sources. Although we believe the information obtained from public and third party sources to be reliable, we have not independently verified it, and we cannot guarantee its accuracy or completeness. Investec’s internal data may not be audited. Except as otherwise authorised, this information may not be shown, copied, transmitted, or otherwise given to any third party without Investec’s prior written consent. © 2018 Investec Asset Management. All rights reserved. Issued by Investec Asset Management, issued May 2018.